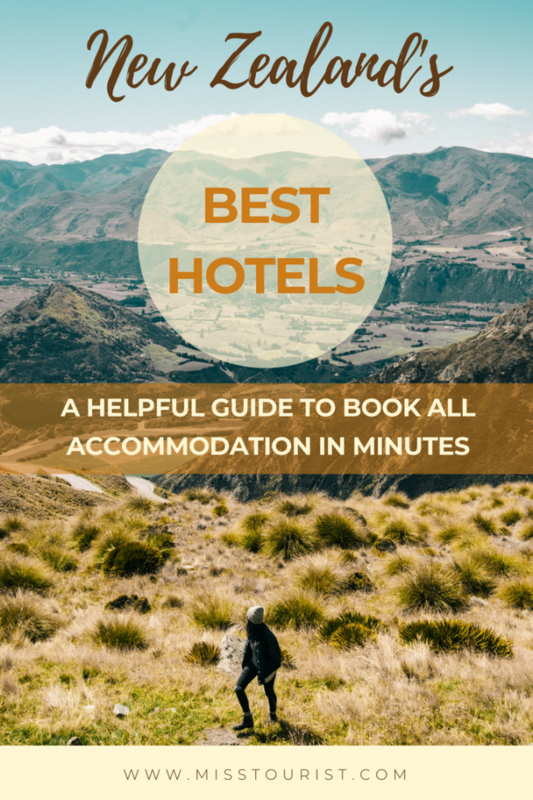 If you are starting to plan your New Zealand trip and you need to book fast all the accommodation you need during your stay, I’m here to help! I have carefully chosen the best places in both North Island and South Island and I hope you will read my recommended itineraries. 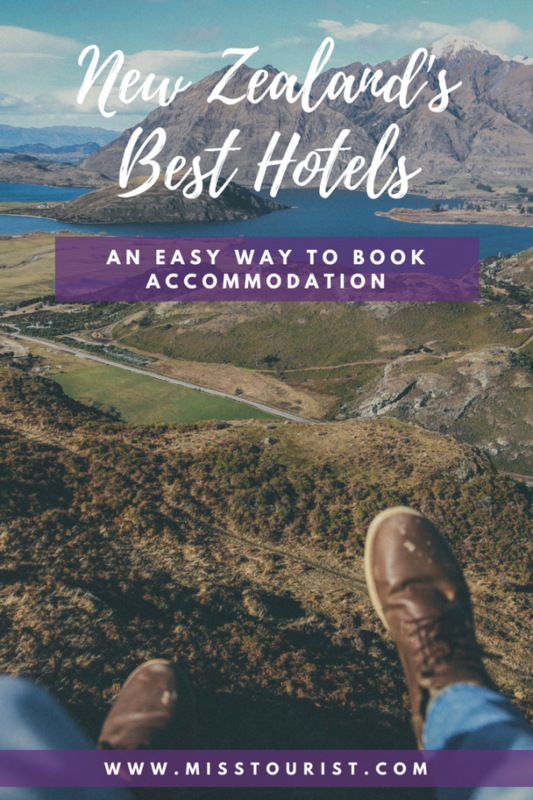 In this list you will find accommodation options that will fit every pocket, from luxury to budget and all of them have amazing reviews and facilities. We will start our New Zealand journey in the North Island. If you want to see the full itinerary with details on what you can do in each day, check out my article about North Island 1 week road trip. M Social Auckland is a great luxury hotel in Auckland, situated right on the iconic Quay street! They await you with free WiFi all over the accommodation and 190 rooms decorated with great taste and design. They also have a fitness center, on-site restaurant and bar where you can enjoy some very good meals and drinks during your stay. Cordis, Auckland by Langham Hospitality Group is another great luxury choice in a wonderful neighborhood of the city, located very close to Auckland’s main attractions. The rooms and facilities are super modern and stylish and they even have a very wide range of dining options, a lounge club, a spa and more! Grand Millennium Auckland is an awesome 5-star hotel located in the heart of Auckland. They have 452 rooms decorated in a very chic and modern way, a gym, a heated indoor pool, a bar and an excellent Japanese restaurant. All in all, you will find there everything you need for a comfortable, luxury stay in Auckland. Parnell one bedroom with ensuite is a great middle priced bed and breakfast where you will have your own patio. It’s a 4-star accommodation with a super convenient location, only 16 km away from the airport. They also have a great buffet breakfast that you can enjoy during your stay. Ponson by Manor Guest House is an amazing 5-star accommodation with middle-priced rooms. It’s located only 18 minutes away from the beach and it has great BBQ facilities and a guest lounge that you can use while you’re there. The Shakespeare Hotel is another great option situated in Auckland Central Business District with an English-style décor and a pub with its own brewery. They even have an on-site restaurant with great food and a terrace where you can enjoy some amazing meals and drinks! Metro Adventurer Backpackers – a cool hostel situated in the heart of Auckland that offers free WiFi, private parking and even storage lockers where you can keep your luggage. This nice accommodation is only 10 minutes away from Viaduct Harbor, a great place full of restaurants and pubs. You can choose from dormitories and private room, depending on your desire. iholiday it’s only 10-minutes away from the beach and it also offers private parking (perfect for your rented car!). I recommend it for any type of traveler – solo, couple or even families or groups of friends. YMCA Hostel is a 4-star accommodation perfect for low budgets. They have separate female and mixed dorm rooms where you can get a good night’s rest and prepare for your next adventure. They also offer luggage storage and laundry! Naumi Auckland Airport Hotel, which offers a 5-star luxury accommodation with stylish rooms, located only 3 km away from the airport. They have an on-site restaurant and very spacious rooms. Holiday Inn Auckland Airport awaits you with an awesome pool and a beautiful garden. They even have a swimming pool, a fitness center and an on-site restaurant. They offer free on-site parking too! 850 Cameron Motel is a very clean and beautiful place for a luxury stay. This accommodation is situated only 4.5 km away from the glow worm kayak tours, which is very convenient. They have air-conditioned apartments with kitchenette and garden views. I totally recommend it for a solo traveler or for a couple! The Tauranga on the Waterfront is a great 5-star hotel, located very close to the city center. They await you with free WiFi, free parking and a very nice balcony for some rooms. You can also benefit from the laundry, dryer and luggage storage. 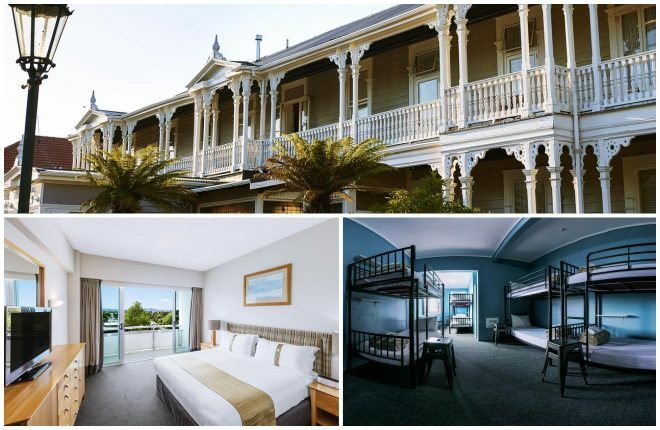 Hotel on Devonport is an amazing accommodation in Tauranga, situated only 10 minutes away from the beach. One of the nicest things about this place is that you get a welcome drink and the daily newspaper once you get there, so you will instantly feel at home! Accommodation at Te Puna Motel and Holiday Park is not far from Waimarino and it offers a swimming pool, a kid’s playground and even a BBQ area that you can enjoy during your stay. You will get free parking, laundry facilities and even a games room that I totally recommend for groups of friends for some well-deserved fun after a day of exploring the surrounding area! Comfort Inn Academy has a swimming pool, hot tub and lots of breakfast options that you can choose from! The rooms are comfortable and tidy, perfect for a good night’s rest in Tauranga. Hotel Armitage and Conference Centre is another good middle-priced accommodation with big rooms, a great outdoor pool and room service. Of course, you’ll also get free WiFi and an on-site restaurant where you can enjoy some yummy meals. Oh So Central to Tauranga is located only 2.8 km away from the Waimarino Glowworm Kayak tours and it even offers free parking that you can use. The rooms have a flat-screen TV and a gorgeous seating area where you can enjoy the beautiful view. Tauranga Central Backpackers is only 6.4 km away from the kayak tours. This is a very good budget that offers clean, air-conditioned rooms and access to a shared kitchen and laundry facilities. Overall it has a great money-value balance. ArtHouse Accommodation Boutique Backpackers is my third and last recommendation for budget travelers in Tauranga. They have shared rooms and a very nice décor that will instantly make you feel at home. You will also be able to use the shared kitchen and the gift shop that you will find at the accommodation. If you wish to stay in Rotorua instead (although I don’t really recommend it because we personally felt a bit tired driving in the same evening after kayaking), you will find hotels recommendations in Day 3 below. 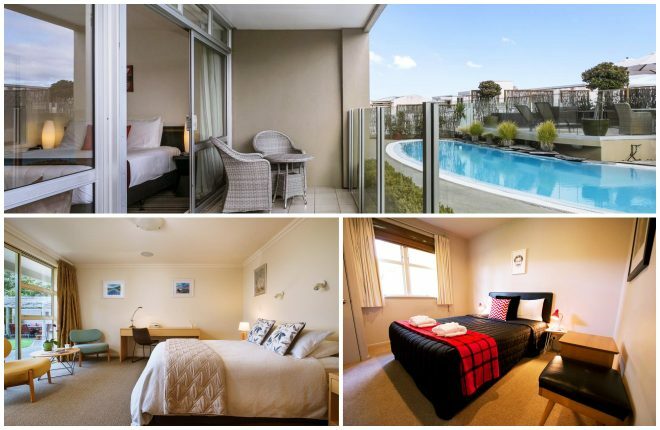 In case you are searching for a gorgeous accommodation in Rotorua that will help you feel at home, I suggest you book your stay at Prince’s Gate Hotel. This incredible place is a 5-star boutique hotel situated right across the street from the Polynesian Spa. This place actually looks like a castle and you will surely feel like a princess there! Another luxury option is Quest Rotorua Central Apartment Hotel that has a great location, only 700 meters away from the Polynesian Spa. If you decide to book a room here, you will get to use the laundry facilities and a fully equipped kitchen, perfect if you prefer to cook your own meals. This accommodation is also located very close to the zorbing place – only a 15-minutes drive! Millennium Hotel Rotorua is my last luxury recommendation, situated very close to Lake Rotorua and the Polynesian Spa. All the rooms are super clean and they offer an amazing view over Lake Rotorua, that you will surely enjoy. They even have an indoor pool, hot tub, a spa and a fitness center. What more can you wish for? Holiday Inn Rotorua is my first recommendation for people who are traveling in New Zealand on a middle budget. This place offers free parking (perfect if you will rent a car during your New Zealand stay) and free use of the amazing heated swimming pool and fitness center. If you’re going there with children under 12, they can stay and eat for free. Sudima Hotel Lake Rotorua is a 4-star hotel situated very close to the Polynesian Spa and Skyline Rotorua, which you will find to be very convenient. They have an excellent on-site restaurant where you can eat some delicious meals and the rooms are very clean and cozy. Jet Park Hotel Rotorua is my third middle-priced recommendation and I must say it’s a great choice. It’s located only 5 minutes away from the city center and it has many facilities such as free WiFi, free parking, continental breakfast, a boutique café and more! Crash Palace Backpackers is a cool budget accommodation that offers a hot tub, a nice small bar and even some DJ equipment in case you want to organize some parties together with your friends! You can even relax in the outdoor terrace with BBQ! Rotorua Downtown Backpackers is a very modern hostel situated in the center of Rotorua. They have free WiFi and a chill outdoor space where you can enjoy the view. One of the best things about this place is that you can choose between dormitory rooms and private rooms! If you still haven’t found the perfect budget accommodation for you, I suggest you take a look at Rock Solid Backpackers Rotorua – they have clean rooms and a big guest lounge where you can relax. Chalet Eiger is the place where I stayed in Taupo and I really enjoyed it! This 5-star place is located in a wonderfully secluded place, surrounded by beautiful nature and a lot of fresh air. The owners are very nice and they will make you will at home in the clean and intimate rooms. Acacia Heights Gardens is a luxury bed and breakfast with many great facilities such as a hot tub, a cozy and awesome seating area and a great continental breakfast that you can enjoy every morning. The rooms are super stylish and chic and I’m sure you will appreciate the tidiness of the place! 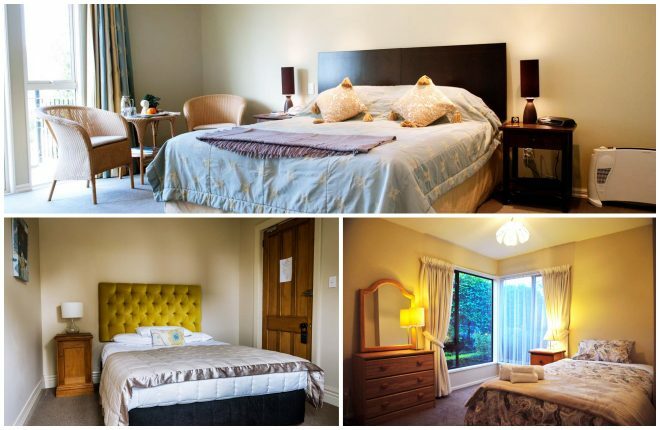 Beechtree Motel is another 5-star hotel where you can enjoy a good luxury stay! The rooms are very chic and clean and they also have a big seating area where you can stay and relax with a cup of tea. Some of the rooms even have beautiful lake views! Of course, I have three recommendations for people who are searching for middle-priced hotels. Just remember that the rooms are selling out very fast in New Zealand so it’s totally worth it to book in advance in order to save some money and time. For the middle budget traveler, my first recommendation is The Reef Resort – Heritage Collection. This great place is situated only 9-minutes away from the beach and they even have a cool outdoor pool that you can use whenever you wish. All the rooms are clean, spacious and full of natural light! You can also book a room at Acacia Lake View Motel– a hotel situated only 300 meters away from Taupo city center. They have free WiFi all over the place and flat-screen TVs. If you’re the type of traveler who prefers to cook their own food, you should know that some rooms even have a nice kitchen! Quest Taupo is another cool accommodation where you can choose if you want to stay in an apartment or a studio. They have free WiFi and even an outdoor pool that you can use during the hot summer days if you want to relax and refresh yourself. My first budget recommendation for Taupo is The Lake Motel – an awesome place with great value that offers free WiFi and even free bicycle hire! You can also enjoy some time outside on their outdoor dining area that has BBQ facilities too! I suggest you take a look at Pouakani Apartment Taupo too, where you will find both apartment and studio style accommodations that you can choose from. This place is very close to the city center (only 800m away) and you will get to see some stunning views from the terrace/balcony! 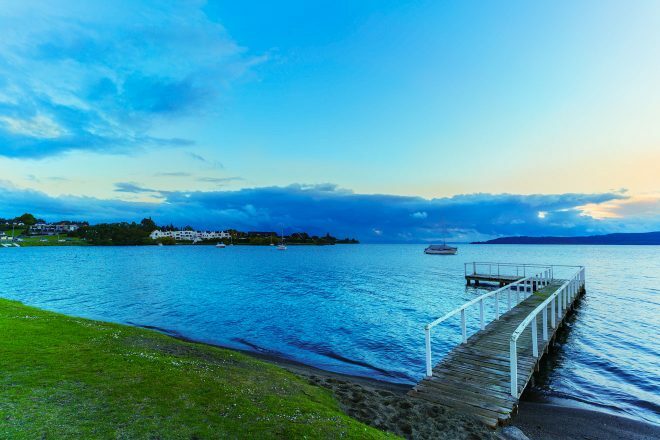 My last budget recommendation for Taupo is Haka Lodge Taupo – an accommodation located very close to the beach, with stunning reviews! They await you with dormitory and private rooms and a hot spa pool that you can enjoy whenever you wish! Bolton Hotel is a great luxury choice in Wellington. 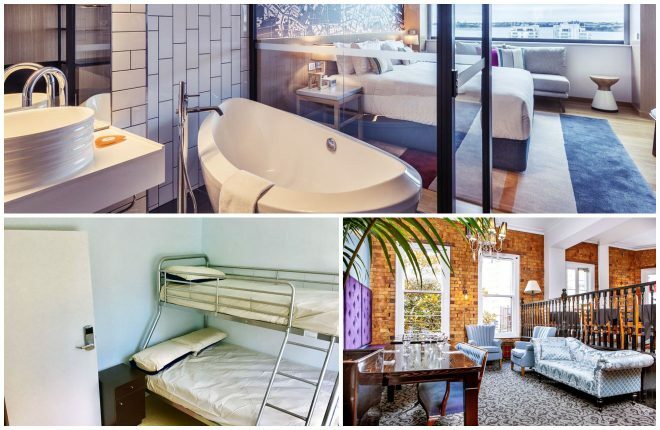 This super elegant 5-star hotel located in the central business district in Wellington has awesome rooms with amazing décor choices. You will find free WiFi and even iPad minis in the rooms that you can freely enjoy and use as you please. Another high-quality 5-star option is InterContinental Wellington, where I’m sure you will feel like a queen or king. One of the best advantages of this hotel is that it’s only 3-minutes away from the beach! They even have a luxurious and spacious lounge area where you can relax after a day full of adventures! My last luxury recommendation is Grand Mercure Wellington. You will be greeted by some very friendly and helpful staff and they will make you feel at home! They also have an on-site restaurant, conference rooms and beautiful rooms. Best thing of all? It’s super close to the airport and Weta Workshop! I recommend you book a room at Novotel Wellington if you’re looking for a middle-priced accommodation with great money value. The hotel is located only 15-minutes away by foot from Te Papa Museum and 15 minutes drive away from the airport! If you wish to be closer to the water, you can stay at Beachfront Wellington Bed and Breakfast. They have many great facilities including free Wifi, free breakfast and some clean and spacious rooms, decorated with style. 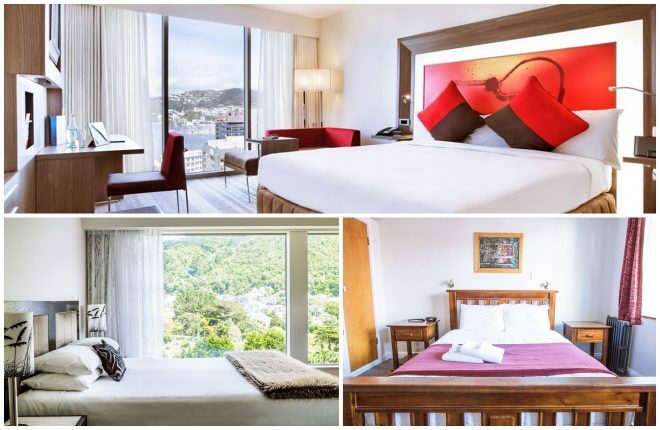 If you still haven’t found the perfect accommodation for your budget and needs, then I have another suggestion – Park Hotel Lambton Quay – a 4-star accommodation located right in the city center. Plus, you will get access to their great gym! For a good budget stay, I recommend Hotel Waterloo & Backpackers. This hotel is situated in the center of the city and they have a 24-hour guest kitchen that you can use when and how you please, laundry facilities and even game rooms which are very fun! Another suggestion is Trek Global Backpackers– a cool place that offers free unlimited WiFi and even a barbecue area where you can relax and prepare some great meals to enjoy together with your friends. Plus, you can even rent mountain bikes here that you can use to explore the surrounding area! The Setup on Dixon – Hostel is a nice place where you can rent dormitory rooms that have either a shared bathroom or a private one. One of the best advantages of this hostel is that it’s only 5 minutes away by foot from Te Papa Museum! 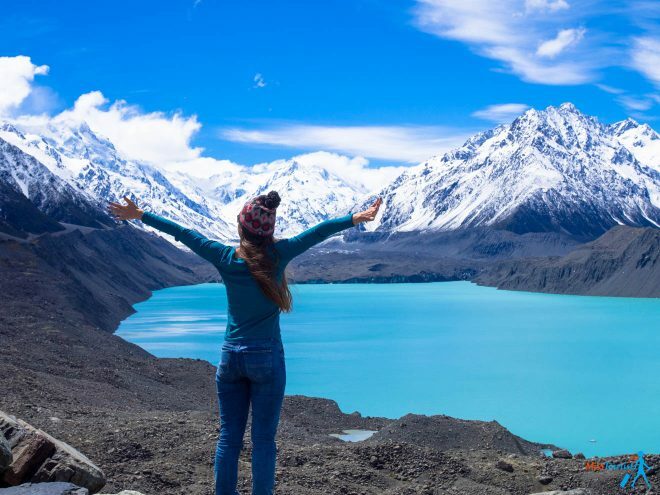 The days are planned according to my two-week road trip itinerary around the South Island in New Zealand, which is detailed in this article. Clearview Lodge is the place where I stayed and I consider it to be the perfect option for a couple. It is actually a lovely little chateau that has only 3 rooms in total and all of them are super chic and cozy! It’s the ideal place to relax, eat organic homemade food and drink well-produced wine in the garden! You can see more details and pictures in my detailed description here. Eco Villa is another cool option located right in the city center! This accommodation is super eco-friendly and it has a garden, outdoor baths and many other facilities. One of the best things about this accommodation is that you can rent bikes for free, that you can use to visit the city and the surrounding area! Hotel 115 is a nice 4-star hotel with contemporary décors and very clean rooms. One of the craziest things about this hotel is that the city tram runs right through it – so unique and cool! You can choose from many different rooms and I recommend it as a place to relax during your Christchurch stay. The Grange B&B is the perfect middle-priced option if you want a cozy place that offers free gourmet breakfast. This hotel is actually a Victorian house with classical and beautiful rooms! They offer free WiFi, free off-street parking and many amazing facilities. On the other hand, Pomeroys on Kilmore awaits you with a stunning garden where you can stay and just unwind after a day full of walking and discovering the city. Each room has a private bathroom, a TV and is decorated in a very stylish manner. You can also enjoy a very good continental breakfast there! Rendezvous Hotel Christchurch is my last middle-priced recommendation and the perfect place to stay in if you love contemporary decorations. This hotel even has a fitness center, a business center and an on-site restaurant and bar! The first one is 3 Rooms At Jellie Park, a gorgeous Bed & Breakfast that I consider to be perfect for a group of people that love breakfast cereals! They have a pretty lounge and sitting area where you can enjoy meals together or just relax. Christchurch Central Apartment awaits you with a shared kitchen and a beautiful terrace with great views of Port Hills. This accommodation has a very convenient location – only 11 km away from the airport! Rainbow Selfservice Ensuite is a very clean and nice budget accommodation which offers breakfast each morning. They have both free WiFi and free on-site parking and many useful facilities! If you want to feel like a king or queen while in Hokitika, then I suggest you book a room at The Villa Holiday Home, which I think it’s perfect for a group of friends. You will get the entire luxury house for 8 people with a gorgeous garden and BBQ, perfect for spending some time together just cooking and relaxing! 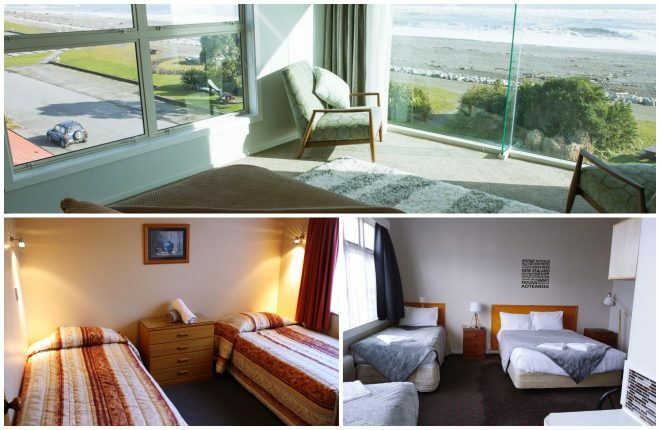 If you’re not traveling in a large group, then a room at Beachfront Hotel Hokitika should be perfect for you. This luxury accommodation is located right on the beach, so it has stunning views and it’s the perfect place to get some sleep while listening to the sound of the waves! Stopforths Motel is another 5-star luxury accommodation situated very close to a beautiful beach. They even offer an astronomy tour, spa baths and bike rentals! What more could you wish for? If you’re looking for a great middle-priced accommodation that’s located close both to the city center and the beach, then you should book a room at Jade Court Motor Lodge. You will get free 100MB of WiFi and electric blankets in case the weather is cold. If you want, you can even get the breakfast delivered to your room each morning! My second middle-priced suggestion is Bella Vista Hokitika – this place is in the heart of Hokitika, very accessible and close to many restaurants and shopping places. It is very close to the beach, too (only 6 minutes away) and the rooms are very bright, clean and cozy. Shining Star Beachfront Accommodation is very close to the beach and you can rent beautiful beachfront chalets there. Each room has free WiFi and a private balcony and the entire accommodation has its own private beach! Hokitika Pioneer Hotel is a very special and unique place if you’re the kind of person who likes old-style country pubs that also offer rooms for rent! This hotel offers a delicious continental breakfast each morning and some rooms even have a stunning garden view! 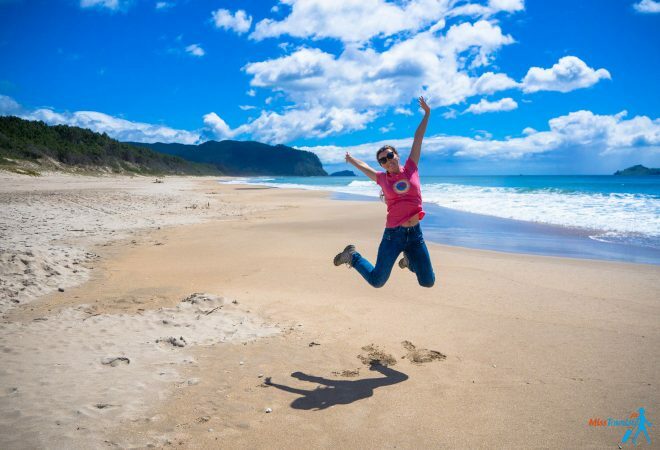 Mountain Jade Backpackers is an accommodation located super close to the beach and it offers shared guestrooms for very good prices and great facilities. This hotel is actually a beautiful building from 1995 that even has a great lounge area! Kaniere Hotel is another good budget hotel that will greet you with a super friendly dog! This is actually a nice country restaurant and bar where you can rent cozy and simple rooms. 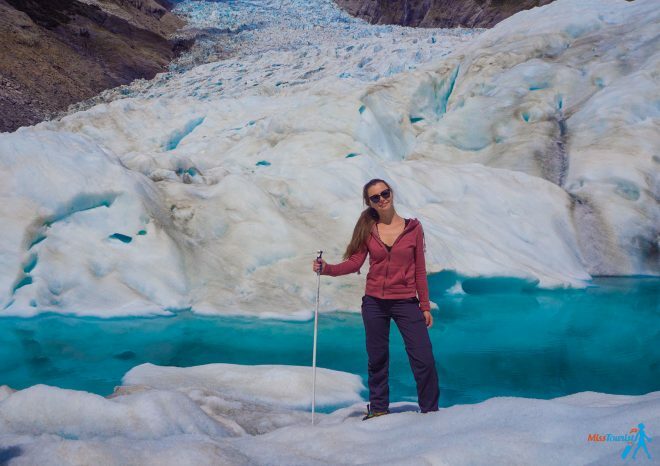 If you want to stay in an awesome luxury accommodation near Fox/Franz Josef glacier, then you should take a look at Aspen Court Franz Josef – surrounded by beautiful nature, this gorgeous place is only 9.7 km away from the glaciers. My second suggestion would be Franz Josef Treetops (9.6 km away) with free WiFi and gorgeous design. I highly recommend it for a group of 7 people or less, because this is an entire vacation home. 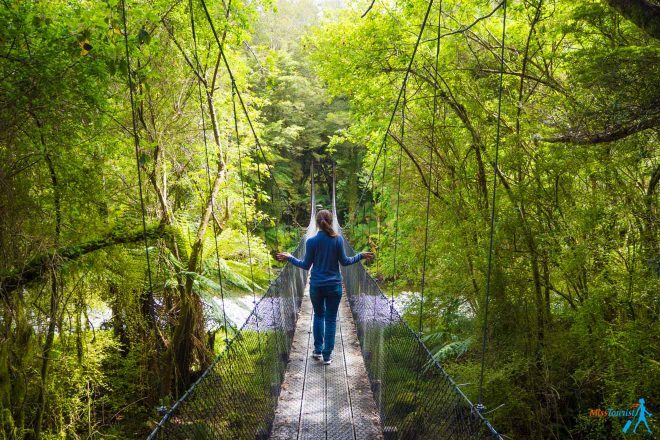 Rainforest Retreat is another amazing 4-star accommodation near Fox and Franz Josef glaciers. It even has a spa and a sauna, an on-site bar and restaurant and a gorgeous outside area where you can relax or make a BBQ. Top 10 Fox Glacier Hotel is the hotel where we stayed in and we really enjoyed our time there! We really liked the simplicity of our apartment (it was a small house in fact) because it had very clean rooms and a fully equipped kitchen that we could use whenever we wanted. 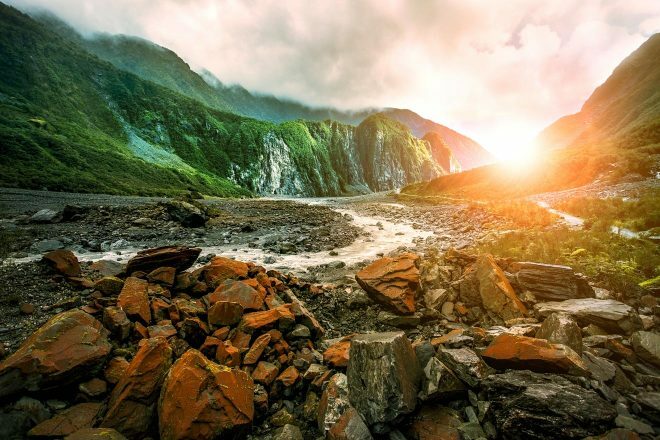 One of the best things about it is that it’s only 10 minutes away by car from Fox Glacier! You can also book a room at Glacier Highway Motel, a cozy and nice motel situated only 3.4 km away from Franz Josef glacier. Some of the rooms have a stunning lake or garden view which I’m sure you will enjoy! Sunset Motel is my last middle-priced recommendations and a very tidy and nice accommodation where you will have a beautiful view of Mount Cook! It’s also very close to Fox Glacier, which makes it very convenient for travelers. 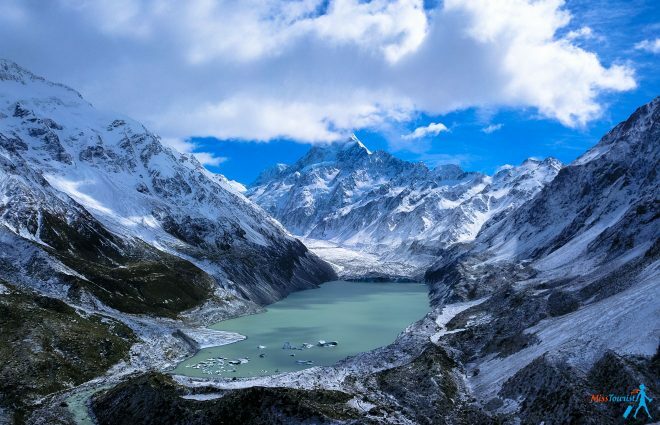 For a quality budget stay near Fox and Franz Glacier I recommend Franz Josef Montrose, which is located only 9 km away from the glaciers. You will get unlimited WiFi and free parking and the rooms are super cozy – perfect for a good night’s sleep! Glow Worm Accommodation awaits you with free breakfast and some free lunch options, as well as a great spa pool and BBQ facilities. It’s a little bit more far away from the glaciers that my other recommendations (25-minute drive), but still a great option for budget travelers! My last budget recommendation for accommodation near the glaciers is Ivorytowers Backpacker Lodge – a nice and clean place where you can book rooms with shared bathrooms. The best part? 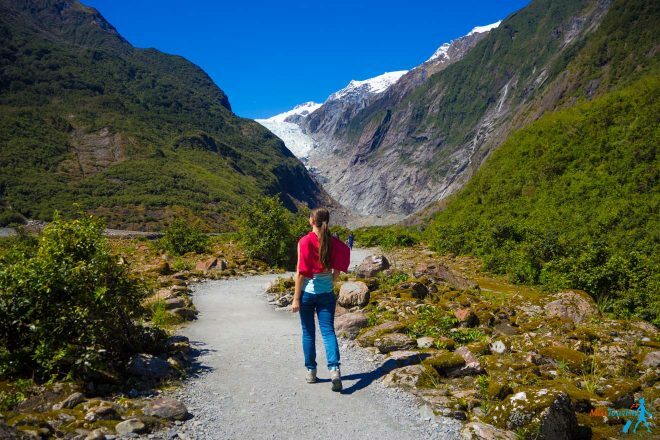 It’s just a 4-minute walk from Fox Glacier Village! Golfcourse Road Chalets is a 5-star luxury accommodation located on an amazing setting: 10 acres of gardens! You will see amazing views on your window, varying from golf courses, lakes and mountains, depending on your room. The chalets are also very close to the beach! 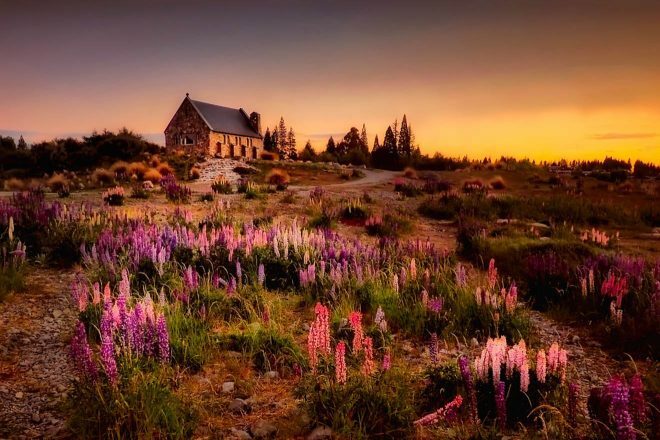 My second suggestion is West Meadows of Wanaka, a great luxury place where they have free Wi-Fi, free parking and free taxi return from the city center, in case you want to wander there to explore. If you’re going there in the winter, you should know that you can even rent ski equipment there! The Moorings Motel and Apartments is another cool option located close to both the beach and the city center. The rooms are super tidy, the lounge area is very chill and you can even benefit from the BBQ facilities! 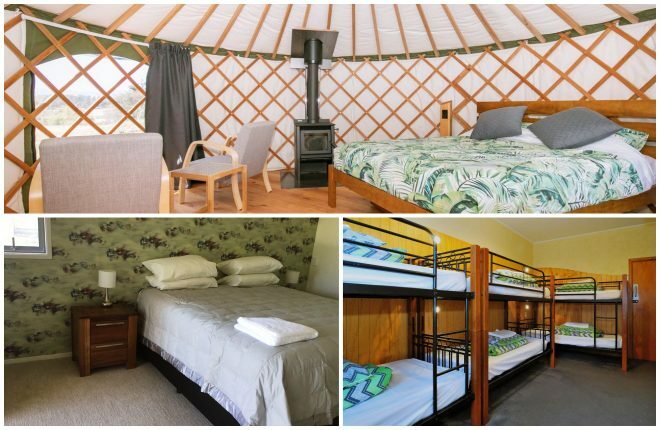 Oasis Yurt Lodge & The Shed is a great eco option that offers individual Yurt rooms and eco-lodges and a relaxing outdoor dining area. The rooms are clean and cozy, perfect for a good night’s sleep. In case you want to leave right after this day, Wanaka airport is super close to this accommodation – only 7 minutes away! 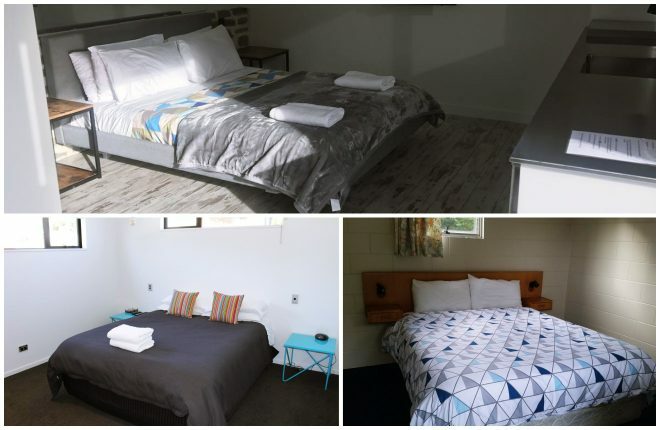 Wanaka View Motel is located very close to the beach and it offers free Wi-Fi, shared laundry facilities and ski drying room, which is an amazing bonus! Wanaka View Motel is also close to some great restaurants and shops and even the lakefront! Lake Wanaka Lodge awaits you with a total of 10 studio guest rooms and each of them is very clean and it has either a balcony or a courtyard. You can even eat Japanese meals made by a Japanese chef here! YHA Wanaka is a budget accommodation located 4 minutes away from the beach. The rooms are clean and they have an amazing view. You can even choose from dormitory rooms or private rooms, in case you don’t want to share! Matterhorn South Lodge is also super close to the beach and it awaits you with different accommodation options such as private rooms, mixed dormitory rooms and a female dormitory room. The staff is friendly and the rooms are warm and cozy! 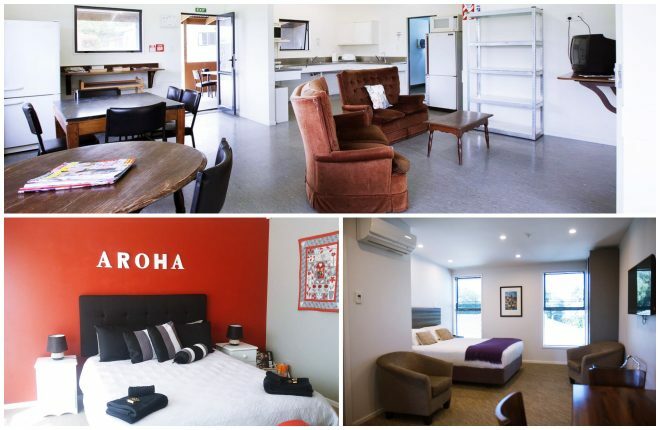 Lake Hawea Hostel is my last recommendation for Wanaka – this place offers free on-site parking, a shared kitchen, shared bathrooms and shared lounge area and BBQ facilities. Queenstown has a diverse range of high-quality accommodations, ranging from incredible 5-star hotels to budget hostels, from luxury lodges, B&Bs, apartments and holiday parks. It pays off to book ahead especially if you are visiting in high season when all the rooms are booking extremely fast! QT Queenstown is a gorgeous five-star hotel with incredibly beautiful rooms and a view over the crystal-clear Lake Wakatipu and the Southern Alps! I’m sure you will feel like a queen/king in the stylish, contemporary rooms. They even have an on-site restaurant where the chef cooks the meals in front of you using fresh ingredients! The Rees Hotel & Luxury Apartments is another awesome five-star option where you will feel like a celebrity. The rooms have a private balcony with stunning views. 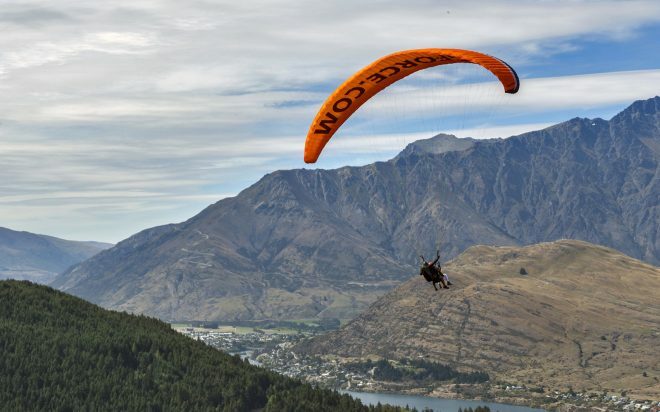 Everyone can enjoy the free shuttle transfer to the center of Queenstown – perfect for people who want to explore the city! Hotel St Moritz Queenstown – MGallery by Sofitel is my last luxury recommendation and a great place located close to the beach. They have some super cool facilities such as a fitness center, on-site restaurant and bar and even a garden where you can find hot tubs! Haka Lodge Queenstown is a nice place with modern amenities and cool facilities such as free parking and free and unlimited WiFi. It’s located super close to the city center and the staff is super friendly! Copthorne Hotel & Apartments Queenstown Lakeview is an amazing 4-star hotel with clean, spacious rooms that have a view over Lake Wakatipu! Some rooms even have private courtyards or private balconies where you can unwind and relax during your stay. 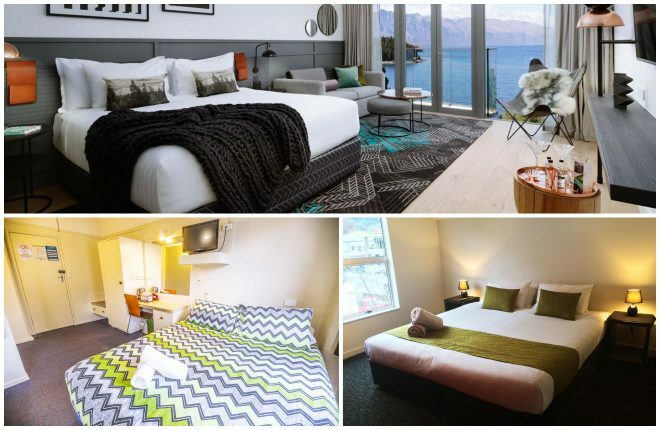 JUCY Snooze Queenstown is a 5-star hotel where you can find middle-priced rooms too. This is a super new hotel found right in the heart of the city. The rooms are clean and beautiful and you can even enjoy a rooftop bar and café! For all the budget travelers who want to stay in Queenstown, I recommend YHA Queenstown Central – they have cozy rooms, a cool view of Lake Wakatipu, a guest kitchen and a stylish lounge area! The staff is super friendly and useful and they can help you with information about tours and how to get around! Absoloot Value Accommodation is located 2 minutes away from the beach, so it’s an ideal place if you want to enjoy a bit of relaxation near the water! You can stay in rooms with private bathrooms and you will also get free unlimited Wi-Fi. Pinewood Lodge is not far from the city center and the overall design of this place is based on simplicity and tidiness. You will be able to choose from a variety of budget accommodation options. 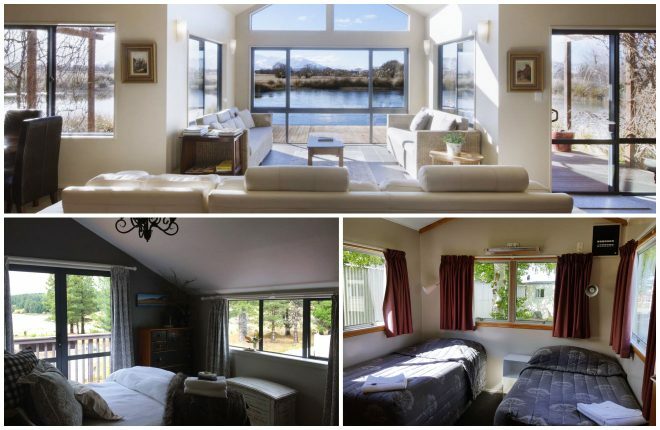 Te Anau Lakefront B&B is a cool place that has an awesome king room with lake Te Anau views. Some rooms even have a private balcony where you can just sit and relax after a day of exploring the South Island! Radfords on the Lake awaits you with beautiful and clean rooms, gorgeous views, free car parking outside each apartment and flat-screen TVs. Some of the rooms even have a private spa bath – what more could you wish for? 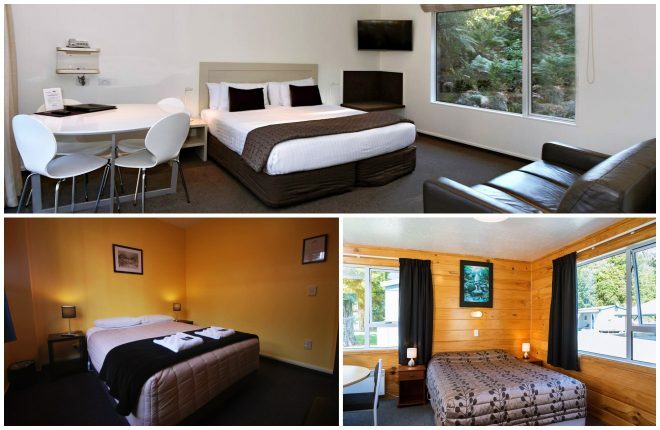 Te Anau Lakeview Kiwi Holiday Park & Motels is a nice and cozy 4-star accommodation with a very wide range of room options. I recommend the deluxe studio with lake view if you would like to feel like a princess while staying in Te Anau! Plus, the staff is very friendly! 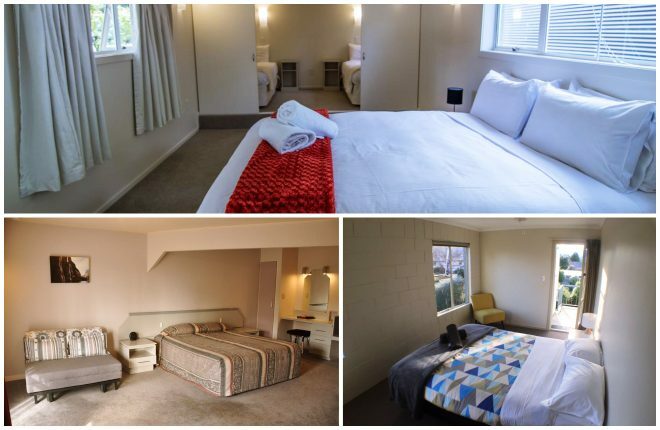 Te Anau Village Inn is a clean and nice accommodation that has an on-site restaurant, bar and even a gorgeous garden where you can stay and connect with the surrounding nature. You can even enjoy a nice evening around the fireplace while staying there! A second option could be Avon House which is located close to the city center! You can choose from a range of cozy rooms surrounded by a garden, which will help you feel at home. Plus, the shared lounge area is very welcoming! Edgewater Motel has everything you could need for a good middle-priced stay in Te Anau – great location, friendly staff, clean rooms and cool facilities such as BBQ, kitchenette and more! Te Anau Lakefront Backpackers is a great, central budget option that has both mountain and lake views in the rooms. You will also get free unlimited WiFi, two movie rooms (one outdoor and one indoor), kitchen facilities and even BBQ! YHA Te Anau has everything you need for a valuable budget stay. You can find there some clean, nice rooms, a great BBQ area, free parking and awesome prices that will fit your budget! Te Anau Kiwi Holiday Park and Motels is my last recommendation for Te Anau and a great budget place where you can relax or have fun in the shared lounge area and get a good night’s sleep in the tidy and comfortable rooms! For this day I recommend you stay somewhere between Te Anau and Mt Cook, so that you could easily reach Mt Cook early morning the next day. 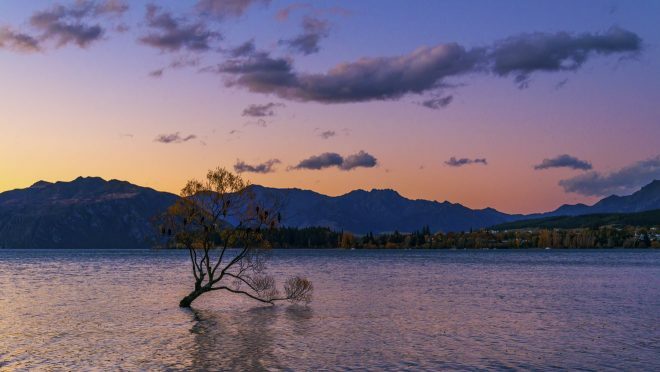 Cromwell, Omarama or Twizel can be some good options. We stayed in Twizel, but I have to warn you that it was almost a 6-hour drive from Milford Sound. If this doesn’t bother you, you can enjoy the stunning views along the way! Looking for an amazing luxury accommodation where you will feel on top of the world? Matuka Luxury Lodge is a 5-star hotel that has every facility you could wish for, including a gorgeous view of the Southern Alps and private patios. Some rooms even have a spa bath and the shared lounge is simply gorgeous! Foehn Cottage is a cool boutique-style holiday home perfect for a group of 3 people. It has an outdoor dining area and the rooms are simple and clean. 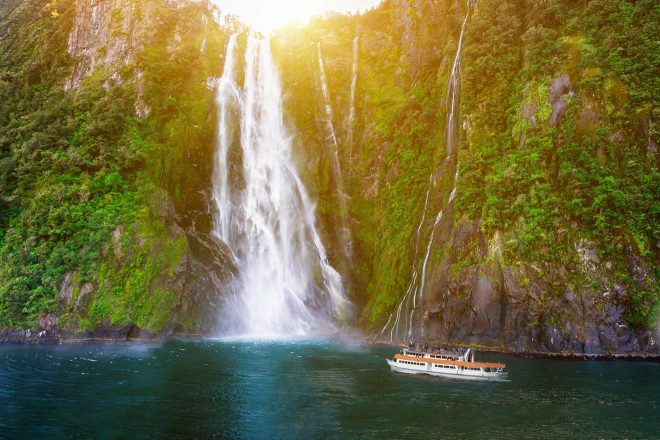 All in all, you will find everything you need here for a comfortable stay near Milford Sound! Heartland Lodge is my last luxury recommendation in Twizel – this place has amazing rooms, spa baths and you can even book local activities right at the hotel such as trout fishing, Lord of the Rings tours, bird watching and more! The Barn at Killin B&B has an incredibly friendly staff and each room has a nice balcony or patio. Included in the price you will also get free breakfast, free WiFi and even a spa pool. Perfect for a comfortable stay in Twizel! A second option could be Gladstone Cottage, which is also located in Twizel. I strongly recommend this accommodation for a group of 4 people because you will have to rent the entire cottage. This holiday home has a nice terrace and you can even rent bikes there that you can use to discover the surrounding area! My last middle-priced recommendation is Mountain Chalets Motel – a 4-star motel that offers an outdoor sitting area, free on-site parking and many other facilities that will transform your stay there into a vacation itself! High Country Lodge, Motels & Backpackers awaits you with free on-site parking, a shared kitchen that has all the facilities you will need during your stay and a cozy communal terrace where you can relax and unwind. The rooms are simple, clean and bright – perfect for a good night’s sleep! 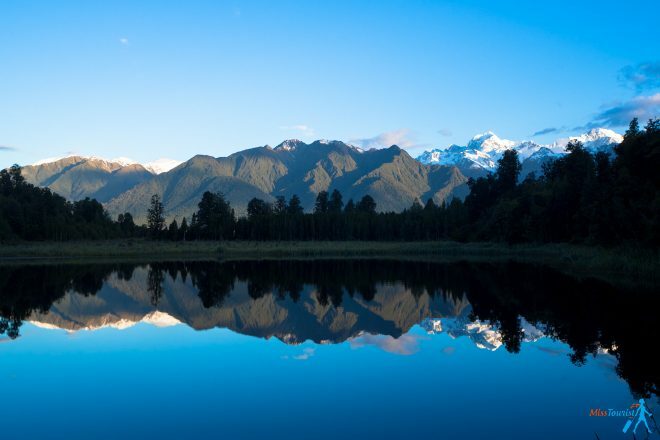 Twizel Holiday Park is super close to the city center and many good restaurants and shop. In the price of a room, you will also get 100MB of free WiFi per day, free parking and you can even rent bikes to stroll around. Dunstan Downs High Country Sheep Station – this accommodation is actually not in Twizel, but in Omarama, not far from the city center. You will also get a delicious breakfast and you can choose from two types of rooms. The Hermitage Hotel Mt Cook is one of the greatest options for a luxury stay new Mt. Cook! 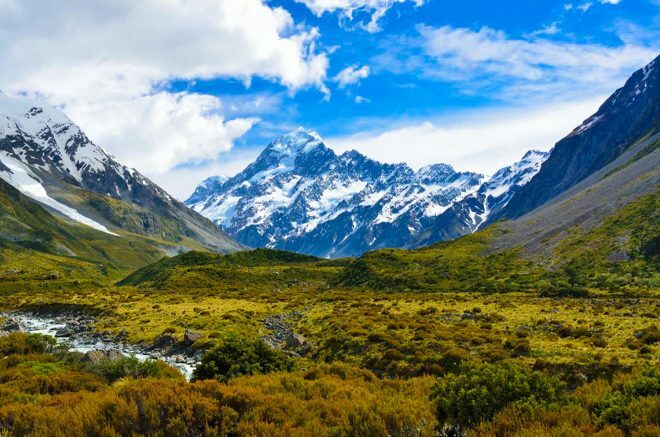 This awesome accommodation is actually right in Mount Cook National Park and it has everything you will ever need to feel spoiled during your stay there! Plus, the staff is super friendly and they can help you organize some local tours! Aoraki Court Motel is another super modern 5-star option, located in Aoraki Mount Cook National Park. The rooms are decorated with style and contemporary furniture and I’m sure you will enjoy the big windows! You can also benefit from self-service laundry facilities, which is a nice bonus. Aoraki Mount Cook Alpine Lodge is my first middle-priced recommendation. You will get to stay in some cozy and tidy rooms, perfect for regaining your strength and energy after a full day. You will also get 1GB of free WiFi per room, a shared fully equipped kitchen and even BBQ facilities that you can use whenever you please! 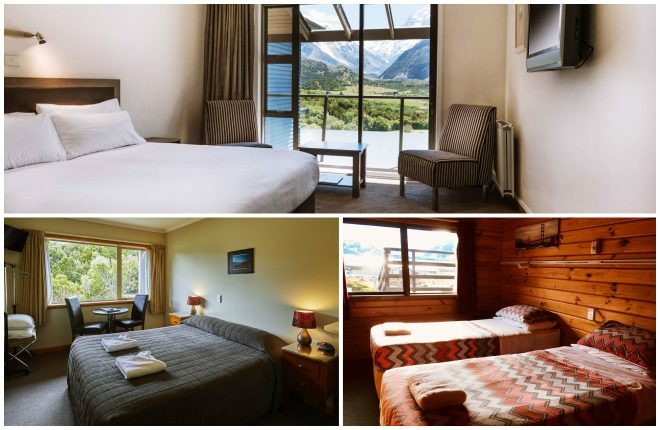 Glentanner Park Centre is a 4-star accommodation that has great panoramic views of Aoraki Mount Cook and Mount Cook National Park. You will be greeted with a big smile and you will get to stay in some pretty rooms. You can choose from self-contained cabins and dormitory rooms, according to your budget or preferences. YHA Mt Cook is an affordable accommodation option located in Mount Cook Village, so you can’t get any closer to Mt. Cook! You will get to benefit from the seasonal BBQ area and you will have free access to a sauna room! I suggest staying here overnight and then taking a morning flight back to Auckland the next day. If this is your plan too, here are my accommodation recommendations near Lake Tekapo. Most of the luxury accommodation options near Lake Tekapo are holiday homes, which makes them perfect for a group of people. If this isn’t for you, you can stay near this area or at your accommodation near Mount Cook. Number 4 is a cool holiday home that can host from 4 to 11 people. They have an awesome living area with a fully equipped kitchen and a big dining table. The entire place is super tidy and nicely decorated, so I’m sure everybody will enjoy it! Nirvana is another holiday home that you can stay in if you are in a group from 4 to 6 people traveling to New Zealand. This place has everything you will need for a pleasant stay and you will be greeted with a nice view of lakes and mountains. Simply Stunning Studio 2 Apartment is my personal recommendation for a couple. It is super cozy and clean and a nice bonus is that the room is air-conditioned. This apartment is very simple and straightforward and it has everything you need for a comfortable stay. Lake Tekapo Motels & Holiday Park is a 4-star hotel that awaits you with free on-site parking, free WiFi, and an awesome shared lounge where you can relax and enjoy a meal or read a book. Fairlie Holiday Park is located in Fairlie and it has simple and tidy rooms, a fully equipped kitchen and a nice shared lounge area. You can even go skiing in the area near this holiday park! If you’re traveling with children, this place is perfect because it has a special playground for them. That’s it! This is my full list of recommendations for both North Island and South Island in New Zealand that will fit every taste and budget. I hope you will find something that fits your needs here. 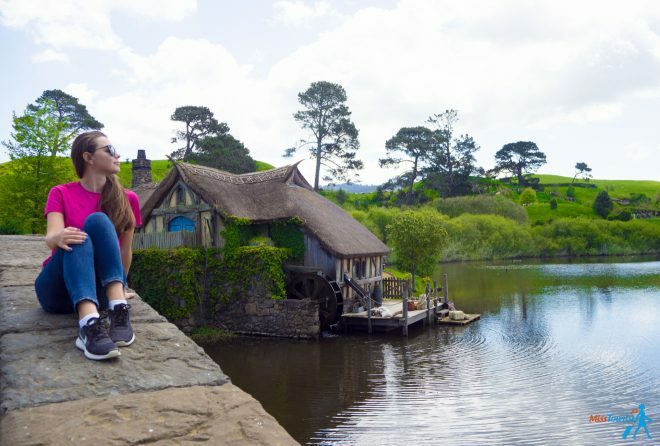 All these accommodation options have great reviews and will help you make the most out of your New Zealand vacation. I hope you will have fun on your trip and, as always, if you have any questions you can leave them in the comments below. I’m happy to help!